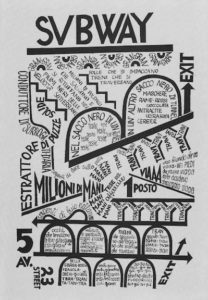 In his lecture on sound poetry, Italian poet and artist Enzo Minarelli briefly described his practice, saying all his sound poems began with words. That may seem obvious and not much help as a definition, but in the context of the Other Minds festival that ran last week at ODC Theater in San Francisco it made startling and concise sense. For the sound, rather than the meaning, of words was essential to the pieces performed. How each performer broke words into sound units and reassembled those sounds defined the performer’s poetry. A word could be reduced to a single phoneme, and that sound would retain a shadow of the word it originated from. 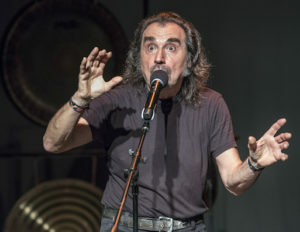 Italian sound poet Enzo Minarelli. Photo by Ebbe Roe Yovino-Smith. Other Minds 23: Sound of Poetry presented some 30 artists, several available only through the medium of recordings and re-enactments of readings. The festival had a strong historical perspective, with a focus on the inventive work of the early 20th-century avant-garde. Wednesday night’s performance opened with reconstructions of work by two leading Italian Futurists with visual projections of their poems: “Dune” (1914) and “Savoia” (1917) by F. T. Marinetti and “Subway” (1939), “Verbalizzazione astratta di signora” (1927) and “Grattacieli” (1929) by Fortunato Depere. Minarelli performed these with striking fidelity to the originals, illuminating how the poets wound their way through their graphically dense scores. Dutch poet Jaap Blonk engagingly performed the 1932 classic of sound poetry, Kurt Schwitters’ Ursonate. Formed of nonsense syllables the Ursonate, loosely translated as Primal Sonata, runs through the musical form until its completion – theme one, for example, reads: Fümms bö wö tää zää Uu,/ pögiff,/ Kwii Ee; theme two, Dedesnn nn rrrrr,/ Ii Ee,/ mpiff tillff too,/ tillll, /Jüü Kaa?, etc. Blonk’s virtue was his ability to make sounds cut free from recognizable meaning sound like language, with emotional shading and conversational flow. This making-sense-out-of-nonsense also characterized his own poetry, which was delivered at the close of the festival’s last night. Other historical recordings included French sound poet Bernard Heidsieck reading his 1970 La Poinçonneuse, with an actress, in a poignant rendering of his encounter with a female ticket puncher on the Metro, the poem’s fragmented and looped narrative recreating the noise of the train’s insistent swaying along the track. Also included was a tape of Gertrude Stein, reading her “If I Told Him, A Complete Portrait of Pablo Picasso” (1934). Members of the Bay Area’s performance community assembled to sing a US premiere of composer Ernst Toch’s Gesprochene Musik with Fugue aus der Geographie, and soprano Randall Wong performed a brilliant rendition of mezzo soprano Cathy Berberian’s Stripsody. Sarah Cahill accompanied the Other Minds Ensemble in a choral version of Virgil Thomson’s setting of Stein’s “Capital Capitals”. Wednesday’s venture into the historical gave an informative spin on the work of the festival’s contemporary participants who, for the most part, have inherited elements of earlier modernist sound poetry. Characteristic of Stein’s prose and essential to Schwitters’ musical form, repetition is a key feature of today’s sound poetry, and is increasingly connected to electronic processes through looping and various forms of echoing and overdubbing. Poet Michael McClure reads from his “Ghost Tantras” at the Gala opening of Other Minds 23: Sound Poetry, The Wages of Syntax. Photo by Ebbe Roe Yovino-Smith. Repetition took on a chilling form in Åke Hodell’s 1970 Mr. Smith in Rhodesia for tape. Part of Thursday evening’s Scandalnavians concert, the tape used British schoolchildren with charming accents chanting “Mr. Smith is a good white man, Mr. Smith is our friend and father.” The innocence of their voices acted as a powerful political commentary on Rhodesian Prime Minister Ian Smith’s racist policies in the mostly white government that broke away from British colonial control in the mid-60s but failed to adopt a majority black rule. Norwegian poet/artist Ottar Ormstad and Russian-born composer Taras Mashtalir presented a set of impressive projections that moved from piece to piece through a field of stars, landing finally in a typographically symmetrical field. Norwegian family names floated past and variants of the word sol, or sun, spun in a circle as Ormstad read them carefully and solemnly. Tone Åse looped fragments of phonemes into patterns and Sten Sandell spoke and sang while exploring the sound possibilities of the piano, knocking on the instrument’s woody parts or plucking strings behind the keyboard. 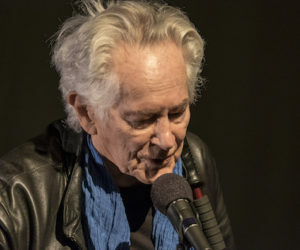 Just as the festival opened with the venerable Michael McClure performing his poetry written in “beast language,” the last two evenings featured sound poets from the Bay Area. Friday night opened with Mark Applebaum’s brilliantly sly tapes, Three Unlikely Corporate Sponsorships (2016). The names of different products by Nestlé, General Motors and Halliburton were fragmented and projected through different speakers with conversation interrupting and casting a darker shadow on our preposterous cultural obsession with branding. Amy X Neuburg. Photo by Rob Thomas. Amy X performed her virtuosic combination of storytelling with looped vocal background and percussive ornamentation. And Charles Amirkhanian performed with fragments of vocal sound against a backdrop of projected collages in splendid Technicolor by Carol Law. In “Maroa” – a word taken from the name of the street where he grew up in Fresno – Amirkhanian stood in front of a highly saturated projection of two plastic palm trees, and repeated the incantatory street name. Enzo Minarelli added a European contrast by reciting phonemes in front of videos shot in moody grays. These “polypoems” included multiple vocal noise tracks providing a background to his vocal performance of a range of emotions projected into single phonemes. The festival ended with transplanted Californian Beth Anderson reciting lists, names and transposed phonemes over percussion provided by Michael Jones. Three short tape pieces by former KPFA programming director Susan Stone provided stories by women, their looped and layered voices revealing incidents of personal pain. And Pamela Z performed five short pieces that were wide-ranging and diverse not only in sound but also in visual presentation, including stills, videos, and her choreographed movement as she gave her laptop cues for sound fragments. 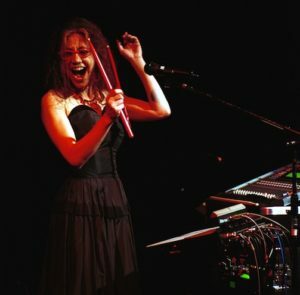 What Pamela Z excels at, besides her excellent vocal work which spans from narrative storytelling to vocalese, is her ability to insert electronic techniques into performance in a near improvisatory way. Her expanded use of singing and electronics opens up a sound palette that makes sound poetry larger than a mechanical recreation of sonic repetition reduced simply to sense or nonsense. Amirkhanian and Co. produced an excellent festival, full of creative possibilities. Thoughtfully planned, the performances showcased the voice in a little known art field that is intimately human.